Nowadays, top Android devices have the same capacity as the five-seven year-old laptops, which were quite suitable for code writing. But due to some peculiarities of modern gadgets, it’s rather hard to do this sacred work on them. However, hard doesn’t mean impossible. 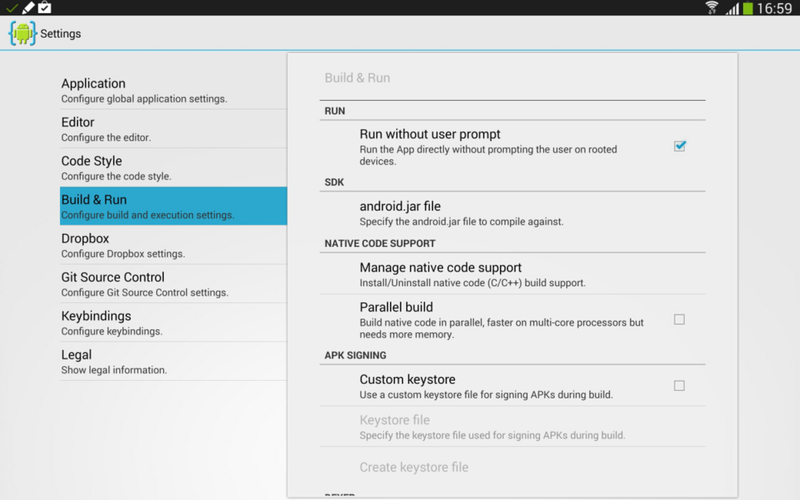 The environments for Android development exist, and there are many of them. The question is — do they correspond to the proud name of IDE? What is essential for convenient code writing, besides compiler and word processor? First of all — at least minimal syntax highlighting support. Second — code completion. And here there are three options. The first one — snippets. These are the abbreviations which unwrap in code line at the press of certain keys (or keys combination). The second one — cache-based code completion, when after keying in a word, one can see all variants existing in cache. And finally the third one — contextual code completion, when you are offered only those variants which are suitable for you. Thirdly… there are many small, but useful features often applied when code writing on PC, for example integration with version control system, debugging message display, and code writing style. Here are several IDEs that more or less meet the abovementioned requirements. But these are, let’s say, program statements. Let’s try, as far as feasible, to analyze how trustworthy they are. So, install AIDE from Play Market. At the first start, you’ll be asked which action would you like to take — to study Java, to analyze Android apps / games development, or to start coding immediately? To make it simpler, let’s assume that you choose the latter. 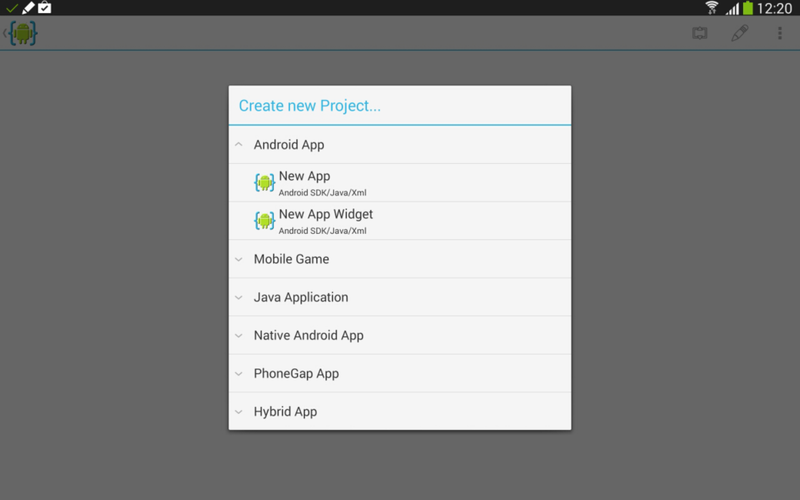 Hybrid App — a mixture of PhoneGap and Java-code. Let’s choose the first option. When creating a new project, a source “Hello, World!” is generated automatically. Perhaps it’s useful for newcomers, but for netheads such kind of care seems irritating. Anyway, some desktop IDEs also do the same thing. Let’s take a look at the interface, which (though it’s full of IDE functions) is rather ascetic. After the project creation, two files get opened: main.xml, which contains layout and actually is a description of the graphic interface, and MainActivity.java, which contains Activity. The files open in tabs. The first tab you see after having created the project — main.xm, which seems to be simple, but it’s very boring to edit it manually. 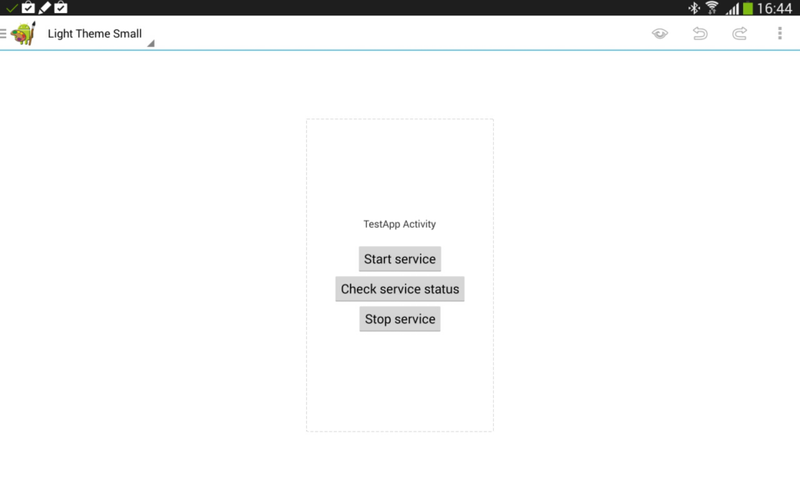 But if you splurge on App UI Designer (which costs around RUR 100), in the upper right corner you’ll see a special start button, and GUI creation will become much easier. I’ll describe its capabilities. Briefly, they are almost as good as desktop GUI designers — the same layout marking, standard widgets, properties editor… Of course there is a drop of poison — I would say it’s impossibility to conveniently link to the strings from strings.xml and absence of functions stubs autogeneration by onClick event; but in whole this tool is really able to facilitate developer’s life. Let’s move to the code editor. Subjectively, syntax highlighting is scantier than in desktop development environments, but in fact it’s quite enough for convenient source code editing. As for code completion, it works in a pretty strange way: for example, in XML files it puts Android classes names in the places where they usually shouldn’t be — in XML properties. It’s the same with Java editor. In Android projects, the names of imported packages often start with android. One would think that in this situation the code completion should work correctly, but it doesn’t — AIDE doesn’t find any suitable coincidence. But if you put “android” and a point, you will be immediately offered variety of other variants, just as it should be in any goodish code completion system. The same thing for overloaded superclasses methods — it’s enough to put public void onC, and at once you will be offered a suitable choice. All fine and dandy, but after stub creation, public void appears again, just when you need to fill the stub with a code. File panel is invoked by tapping an unremarkable sign in the upper right corner; the panel is located vertically from the left side, but the second tap will place it below horizontally. Despite this name, it’s not only a file panel — it contains error panel, search results panel and logcat panel. Git (email and username, folder for a catalogue with SSH-keys…). Here there is one parameter that I strongly recommend to change — tick Create Repo. 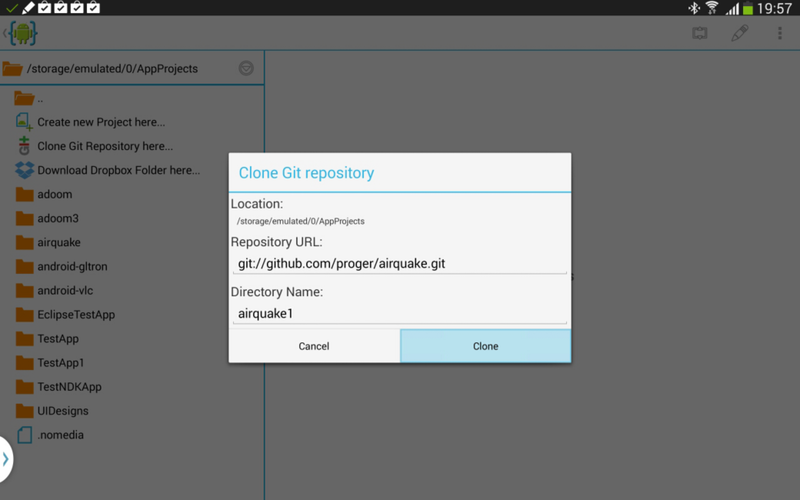 This option forces AIDE to create repositories for new projects. I underline that it’s impossible to create a repository for current projects. Since I have already mentioned Git, it’s better to describe it in details. Working with it in AIDE is a real pleasure. Development environment supports standard operations for Git — clone, commit, pull, push, checkout — but the major part of them is available only in paid IDE Premium version. Repository control is performed from the file panel. If a project is not opened, one can clone a complete one, for example from GitHub. But you should remember that it’s better to use git:// as URL — cloning by https:// doesn’t work well. Directory name field should be filled manually; IDE reaction on double slash is incorrect — instead of cloned repository it puts “-2” in the field. Eclipse projects opening proceeds faultlessly. AIDE, as if nothing had happened, accepted not only a simple application created by me, but also a serious project found GitHub’е. Simple applications setup doesn’t take much time — 13–16 seconds for PureJava projects written without NDK application. In general, AIDE gives rather good impression. Of course, it’s not a desktop development environment, but it can be used for complex applications coding. Yes, there are some gaps, but they are not so serious to impede development. AIDE is definitely worth being bought if you are forced to develop on the way. Despite the name, it’s difficult to call Terminal IDE a development environment. It’s rather a Swiss military knife, which contains many tools — from GCC and Make to Vim and terminal emulator. It’s kind of a minimalist Linux environment that works on any Android device, even if the latter doesn’t have root rights. 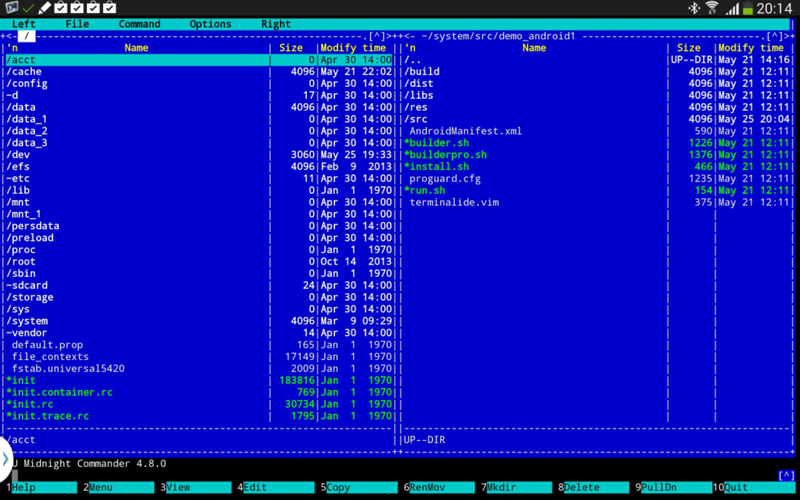 mc — the very Norton Commander clone. :NERDTreeToggle — starts and closes the panel. For more convenience, I recommend to bind this command for example with \ by adding a string like map \ :NERDTreeToggle to ~/.vimrc file. if — you know what it deploys in. It’s also possible to compile to Terminal IDE (by means of F7), but you will need a make file. Before compilation, it’s necessary to unpack toolchain (located in system/android-gcc-4.4.0.tar.gz) in home catalogue manually or through install_gcc command and use C-compiler through terminal-gcc script, which installs the necessary variables and starts the compiler with necessary arguments. Terminal IDE tools set is very large (having patience, you can even set up a core), but this is an “environment” for those who know what UNIX is and got used to Vim and terminal. If you didn’t try anything except Eclipse and similar “all-in-one” environments, IDE is not for you. Run local project … — an analogue of the previous point with the difference that in file selection window, Projects, not Scripts, will be opened as a root directory. Package Index — for QPython there is a QPyPi repository; this icon serves to view it. simple games development (pygame library). Let’s move to the code editor. And here, unfortunately, QPython with its QEdit is not so cool — it can impress only with code highlighting, which also activates only after file saving. Code completion is missing a priori, even based on cache. Actually, the only convenience is support of three boilerplates (Web App, GUI App and Console App), which, for some unknown reason, were called “snippets” by developers. They can be included to snippets catalogue. Several skins are supported: classical, dark, and Matrix — green text on the black background. With the latter, code highlighting looks much more convenient. For indents, there are two buttons in the bottom-left corner. Debugging is performed only under the classical for Android applications scheme — writing to log or (for console apps) screen output. As a framework, QPython is beyond praise — it supports almost all capabilities of a “usual” Python. But as IDE… its functionality is definitely enough for writing small scripts, but it’s not suitable for something more than that. 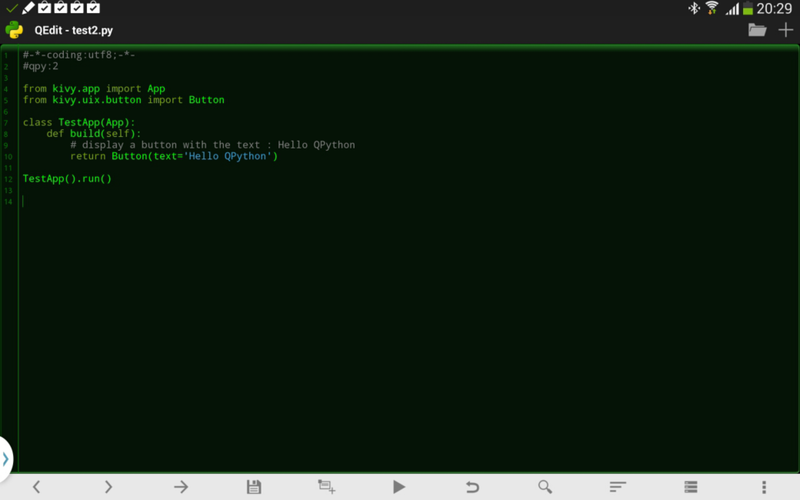 Besides Python, for Android there is also Ruby interpreter called Ruboto. To develop an application on Ruboto, it’s better to use desktop, but if you want to try it on the device, you can install Ruboto IRB development environment after having pre-installed Ruboto Core framework. De facto, this framework represents JRuby 1.7.12with stdlib library, therefore using it one can write and run the same applications that can be run and written using a usual JRuby. Adjustment for internal Android peculiarities, like a diverse internal structure of class files, is performed automatically. 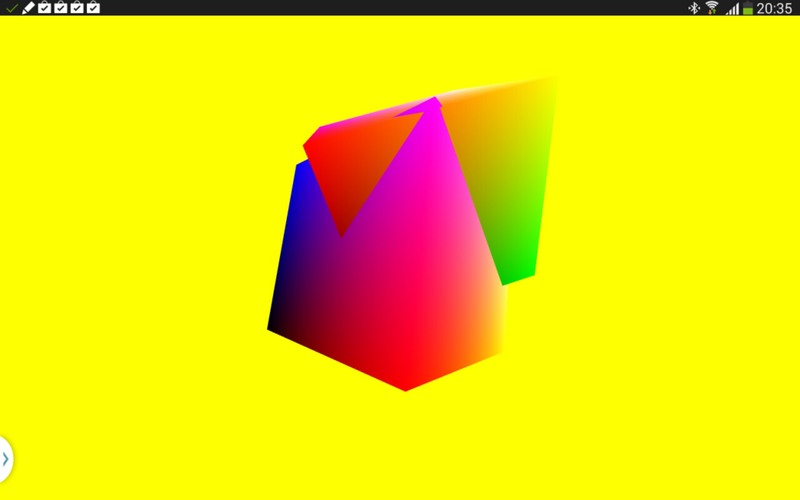 The capabilities of the framework as kind of backend are quite ample — vibration, camera, and even OpenGL. 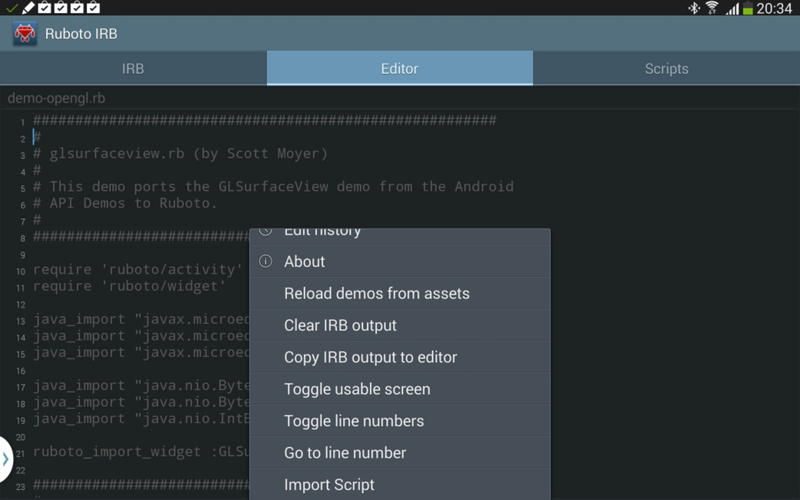 But as a graphic interface for applications developed by means of Ruboto, its capabilities are pretty scanty and primitive, therefore it’s suitable only for writing one-day scripts for your own needs. Speaking about the editor’s capabilities, it’s extremely primitive — not only is code completion missing, but even syntax highlighting. Actually, I could say that the only peculiarity is the possibility to activate full-screen mode without tabs by means of menu point Toggle usable screen. In general, Ruboto gives a strange impression both as a framework and as a development environment. The first case perplexes — almost everything that can be written for a Google OS by means of this framework can be written also without it and often with less expenses. One should also remember that it’s not a JIT-compiler, therefore serious projects (if somebody decides to do that) will lag. Yes, OpenGL demo doesn’t lag, but I doubt that it can be considered as a serious project. I don’t have the heart to call Ruboto a development environment — the code editor doesn’t even have a full-text search! I would say Ruboto is worth being used only in case when you have no PC or laptop around, but you desperately need Ruby, for example, to start a code of an indolent student. 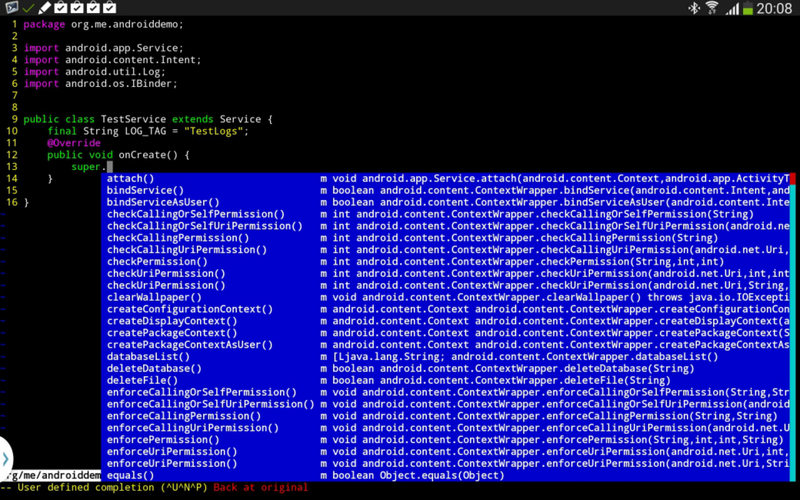 Host-target development for Android is possible and often can be performed even comfortably. In the article I presented some means which can be considered IDE (though some of them can be taken into consideration at a long stretch). 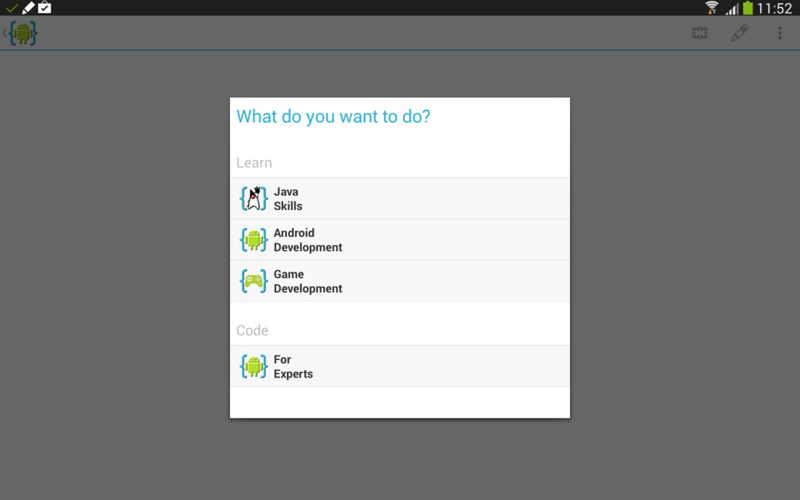 I think App UI Designer + AIDE liaison can be called the most potent IDE for development on Android. It costs RUR 500, but if you seriously deal (or plan to deal) with development, that’s worth the money. 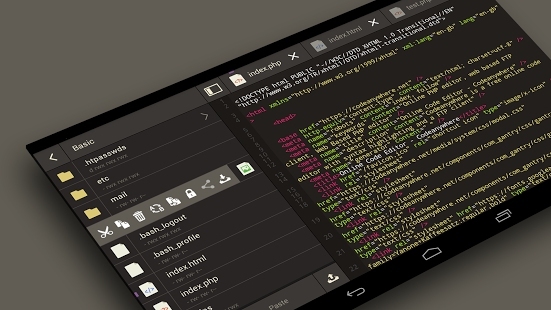 All-inclusive — code completion, handy UI design, and a possibility for NDK apps development. Terminal IDE, though having JavaComplete plugin and APK packages creation tools, is customized to console apps — here it’s second to none. QPython will be interesting for Python fans. As an IDE it’s worse than two abovementioned applications, but, if you get used to it, you can use even its editor. As for Ruboto, I can say Proof of Concept — and there is nothing to add. It hardly makes sense to use it without an urgent need. IDE diversity, as you can see, is quite ample, so the choice is up to you. I am blind, and I have and Anrdoid device that is the Polaris that is made by a company named himsfound at http://www.hims_inc.com. I have a bs in computer science, and have a background in programming. pascal, c and c++ basic, ada, java, and others. I would like to be able to write some programs that uses the Android voice for the output, and input from keyboard. I would like to be able to ssh in to the Android from my windows 7 pc. Can this be done, and if so what do I need to install on the Polaris, and can I just use putty on the pc. I also have done some work on Linux.